Clear bra is a different name used for ‘paint protection film’ technology, or, PPF. Clear bra/Paint Protection Film is a very durable optically clear urethane film that’s applied over exterior painted areas of cars, motorcycles and RV’s to protect their painted surfaces from rock chips, pitting, debris thrown up on the road, organic and inorganic contamination as well as the wear and tear other people create (vandalism, bicycle handlebars in the garage/etc.). Up until around 2012 clear bra technology consisted of 2 layers, the protective film and an adhesive. Modern clear bra technology has 3 layers; the protective film, adhesive and a chemically resistant topcoat layer. This topcoat layer provides chemical resistance as well as something called a self-healing effect. Self-healing clear bra film has the ability to mend marring and light scratches. The ability comes from built in memory in the topcoat layer. As long as the scratch does not penetrate the topcoat it has the ability to mend with time. Heat reduces the time required for the self-healing ability to complete its mending. One of the best things about clear bra is the coverage options! We understand that every client has different wants, needs and budgets. Clear bra technology allows us to install clear bra on as little or as much of a car as someone wants. Some clients have a budget of a few hundred dollars and only feels comfortable with having their front bumpers protected with clear bra and then we have some clients who want the ultimate in protection and have the full car wrapped! 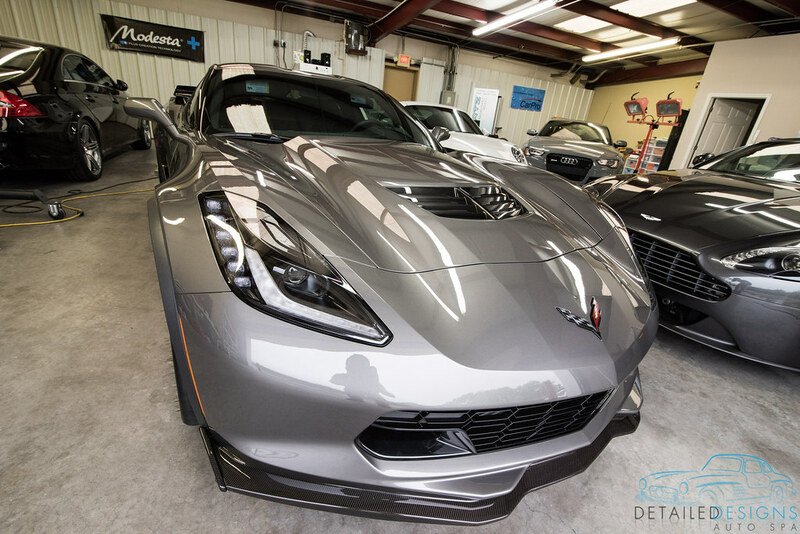 Our most popular clear bra coverage for the Atlanta market is the full hood, full front fenders, front bumper, side mirrors and rocker panels. By going with the full panel coverage on these forward facing sections, the owner not only have exceptional protection but also a beautiful installation due to there not being edges of film going across the middle of panels. In any case, our clear bra options are just about endless and can be as minor or extensive as you want! When having clear bra installed, there are options in brands. Our shop, Detailed Designs Auto Spa, has installed film by Xpel, 3M, Hexis, CCL/Avery, Suntek, Ventureshield and more. Our absolute favorite clear bra films are Xpel Ultimate and Suntek PPFC. These clear bra films are capable of being installed to look beautiful and are backed by warranties that the manufacturers honestly back up. We’ve tried many films and have been unimpressed by either factory defects, poor adhesive, unattractive film or warranties that are difficult to claim. Xpel and Suntek stand behind their films and have installers throughout the USA. When Detailed Designs Auto Spa installs your clear bra in the Atlanta area, know that your warranty is good all over the United States should you move to another state! Removal of clear bra is a straight forward proposition. The adhesive on clear bra is designed to be weaker than the bond of the paint to the car. As long as the surface with clear bra installed does not have a bonding issue with the substrate, there is absolutely no reason the clear bra should lift or pull paint when it is removed. Clear bra can be removed with steam, a heat gun and sometimes with just a little time sitting out in sunlight. It should be removed at an acute angle to reduce any stress placed on the paint. Adhesive residue can be removed with adhesive remover. If you are not a fan of a ‘do it yourself’ approach, you can have Detailed Designs Auto Spa or you local clear bra installation facility professionally remove clear bra from you car. We warranty our craftsmanship/labor for the life of the film. If you ever have lifting film or any other installer error, we will stand behind our name and address the problem. The films we offer carry factory warranties that range from 5-10 years for the original owner. Should you have a factory warranty claim, Detailed Designs Auto Spa will replace the film free of charge and cut through the red tape later. This ensures that you have the least amount of potential footwork and your car is beautifully protected as soon as you notice a problem! Modern coating systems provide additional chemical resistance and enhances gloss and luster for your car on top of clear bra. Modesta coatings compliment clear bra and will ease your maintenance. Hate the idea of waxing your car and getting a build up of wax on the edge of the film? These coatings replace the need to wax and their maintenance sprays are super easy to use and clear, which ensures you don’t get a white wax build up on any edge. We prides ourselves on creating ideal solutions for our client’s needs and we guarantee you will not feel pressured to spend more than you feel comfortable spending. Call us today to schedule a consultation with one of our clear bra installation experts! I am in CA. I have a brand new gloss pitch black 2016 Dodge Charger SRT and need a full wrap PPF asap. I am totally confused? I put a link in for a u tube video for 3m vs. sun tech vs. expel dated 2014, VERY convincing! I would have chosen 3m back in 2014. I own an automotive repair shop, and I know technology changes rapidly. Is their any comparison of the latest films by these mfg.? Have been looking for a week and finding pricing all over the board and not too many experienced PPF installer that have done. SRT full body wrap. The most expensive is the nano fusion with a lifetime warranty, but not finding any good comparisons anywhere. Have YOU tried their latest products?. I am leaning towards suntech but don’t know if it’s durable enough for my application. Could you please call me and give me some advice? The most important factor in your being pleased with a clear bra wrap on your car will be the technician and shop doing the work and standing behind it. I say this after having tested 3M, Suntek, Xpel, Clear Guard Nano, Nanofusion, Bodyfence, Premium Shield and more. One thing I would suggest is that you consider having a Modesta coating applied over your clear bra, exposed paint, wheels and leather seats. It will allow you to have a surface that looks better, is easier to clean and is even better protected. You can find a Modesta installation facility HERE. I wish you the best moving forward Bill!